Grigori Rasputin was neither a monk nor a saint, but even the Orthodox Church held him in high regard as a pilgrim. Aside from his knowledge and ability to explain the Bible in simple terms, he was well regarded by his followers as a psychic and faith healer. It was these very powers that eventually led Nicholas II and Alexandra Feodorovna to invite Rasputin to the royal palace. They hoped he could heal the hemophilia that afflicted their only son. From that point forward, Rasputin's influence grew to include the whole of the Russian monarchy. Was this influence divinely inspired, darkly mystical, or a rouse made possible with a technological breakthrough of sorts? The world may never know. After his brutal murder, Rasputin became immediately enigmatic in that history cast him as everything from righteous minister to madman. What if the power to beguile could be bundled for the modern era. Rasputin's Shadow cleverly casts itself across an entire century as Russian agents in the present day seek to detain Leo Sokolov in New York City. They want to find him because he has a secret. He almost wants to be found because they already have his wife. It seems the retired physics teacher from Russia has rediscovered something from the past, a remnant from his father who once followed Rasputin and understood at least some of the mysterious man's secrets. Now amplified for the modern world, Sokolov wishes he could undo his decision to pursue it again. As a weapon, his breakthrough will never be safe in the hands of anyone. The last time it was used on a grand scale, an entire mining operation became a death camp as the miners began to inexplicably kill each other to the last man. The scene was so horrific, it left the perpetrators stunned before blowing up the entire camp in an effort to hide the evidence. A threat from the past reappears in New York. FBI agent Sean Reilly, still reeling from the effects of his son being brainwashed by a CIA mind control spook, stumbles onto the case after being dispatched to a suicide. Except the man, a Russian embassy attaché, never jumped out of a fourth-floor window in Queens. This one call quickly puts Reilly on a collision course with international implications. As what originally appears to be a Russian conflict with American agents and law enforcement caught in the middle becomes a threat to national security, Reilly must find out who is behind it and how to stop it. 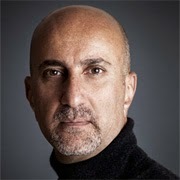 A few graphs about author Raymond Khoury. After he was born in Beirut, Raymond Khoury and his parents emigrated to America after the outbreak of the civil war. He was only 14. Later, he would return to attend a university and study architecture. When the civil war broke out a few weeks after he graduated, he was luckily evacuated by the Marine Corps. He landed in London and joined an architecture practice that led to investment banking. It wasn't until much later that he would write The Maid Of Buttermere (adapted from Melvyn Bragg's novel) and then The Last Templar as screenplays. After a stint as a television series writer, he turned to novels. Rasputin's Shadow is a briskly paced thriller, split between Rasputin's time and the present day. The end of the Cold War also plays a prominent role in the storyline as Khoury frames up post-communist Russia as a relatively bleak trade from bad to worse. Rasputin's Shadow By Raymond Khoury Covers 4.1 On The Liquid Hip Richter Scale. The story is sharp and the pacing brisk, but the craft feels off at times. Some of this can be attributed to the past-present arrangement and switch from third to first person perspectives. When Rasputin's Shadow works, it is as a fictionalized historical thriller, with the thriller being mostly confined to the present. 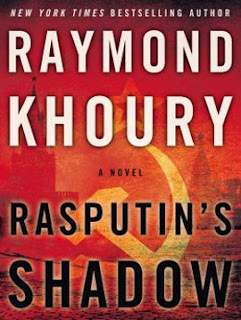 Rasputin's Shadow by Raymond Koury is available on Amazon. You can also download the book for iTunes or find the novel at Barnes & Noble. The audiobook is narrated by Richard Ferrone, who does a particularly good job as Reilly, who dominates the last third of the book.